The National Police Lab AI is a collaborative initiative of the Dutch Police, Utrecht University and the University of Amsterdam. Together we aim to develop state-of-the-art AI techniques to improve the safety in the Netherlands in a socially, legally and ethically responsible way. In the Lab we work on techniques across the full breadth of AI. At the University of Amsterdam, machine-learning techniques for extracting the right information from different sources such as photos, text and video are developed. Utrecht University focuses on models from symbolic AI that allow us to reason with and communicate this information. Aspects such as transparency, privacy and explainability are just as important as algorithmic aspects such as accuracy, computability and efficiency. The Police Lab AI consists of two locations at the Utrecht Science Park and Amsterdam Science Park. 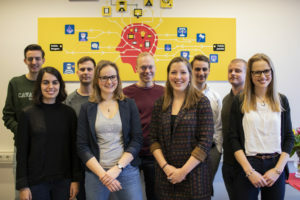 In addition, the PhDs and Postdocs of the Police Lab AI also work part-time at the police innovation teams in Driebergen and Amsterdam. The Utrecht location of the Lab consists of a professor, a scientific director, five postdocs and seven PhD's. The research focuses on intelligent interactive dialogues, reasoning with (legal) arguments and crime scenarios, and integrating symbolic and subsymbolic techniques in AI. The Amsterdam location of the Lab consists of professor, a scientific director and three PhD's. The research focuses on finding summaries, relations and patterns in multi-modal digital data (photos, text, video).